Kinsale, County Cork, is one of those charming little towns that fill Ireland. Built around narrow medieval streets, Kinsale’s population of around 2,000 swells in the summer months as tourists and vacationers flock to the area for boating, golf, fine dining, and relaxation. 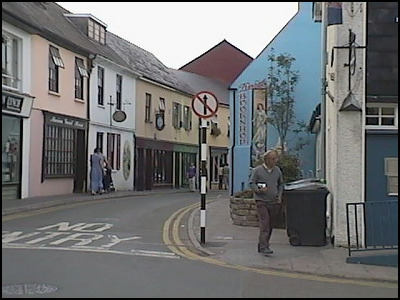 The streets of the town center are lined with shops and restaurants housed in the brightly painted and flowerbox-bedecked buildings that so typify the towns of Ireland. I’m currently obsessed with Kinsale. No, not that Kinsale. I don’t mean the charming coastal town in Ireland. No, my Kinsale obsession is with the sweater designed by the inimitable Alice Starmore that can be found in Fishermen’s Sweaters. It isn’t a slow knit because it’s boring, either. Although the pattern is repetitive, it’s always interesting. 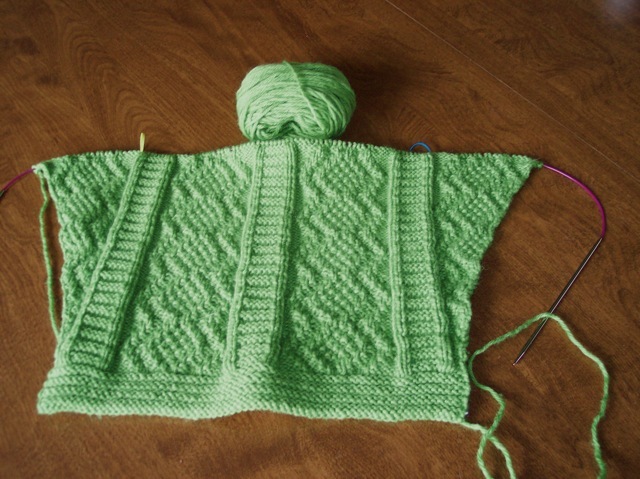 One is always changing from knit to purl and back again, so Kinsale isn’t mindless knitting, like plain stocking stitch or garter stitch, but at the same time, it doesn’t require total concentration, either. It’s very good television knitting. The reason why Kinsale is a slow knit is because the sweater is designed to be knitted on 3 mm needles at a gauge of 7½ stitches per inch of width. For the uninitiated, that means that in order to produce a sweater with a circumference of 48 inches, the knitter must work with 360 stitches. Contrast that with working at a gauge of 5 stitches per inch where you need to work only 240 stitches to get a circumference of 48 inches. Two-and-a-half stitches per inch makes quite a difference. Then there is the row gauge. On Kinsale, my row gauge is 10½ rows per inch of length. For those of you who are, perish the thought, nonknitters, that means that I have to knit 21 rows in order to gain 2 inches of fabric. Now you can understand why Kinsale is taking so long, right? I have the body and neckband of the sweater done, so you’d think I’d be in like Flynn. All I have to do is knit a couple of sleeves. Nothin’ to it, right? 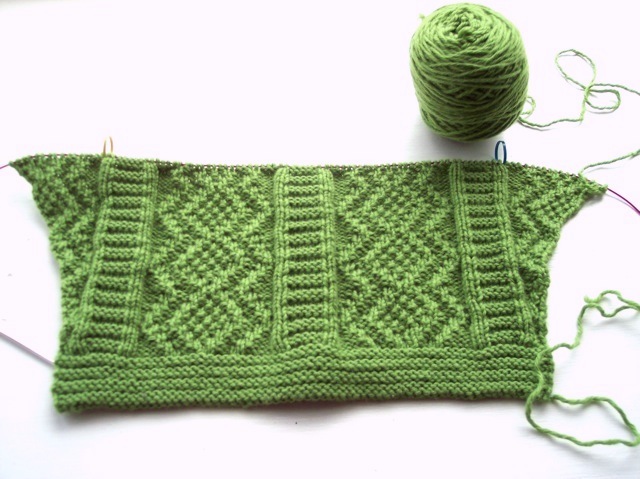 Well, I’m currently working on the first sleeve of Kinsale. It is supposed to have a final length of 18 inches. That means that I have to knit 189 rows total to finish a sleeve. And I have to make two of them. Fortunately, sleeves don’t have to have a circumference of 48 inches. Whew! This sleeve started with 75 stitches and is gradually being increased up to 151 stitches. But still, it’s a slow go. Here’s a picture of the sleeve as of April 18th. And here is the sleeve as of this morning.